The days of a trolley kiosk at the foot of the Queensboro Bridge in Manhattan appear numbered. Listen closely over the din of traffic at the Queensboro Bridge and you just may hear it. The last clang. But listen soon. Because the City Transportation Department hopes to remove one of the few architectural remnants of the once-sprawling trolley system: an elegant but battered kiosk on Second Avenue through which passengers boarded Queensboro Bridge Railway Company cars until April 7, 1957, when the final trolley in New York City rattled across from Queens Plaza. Traffic is precisely the problem, said Tom Cocola, assistant commissioner for public affairs at the transportation agency. That explains why two terra-cotta bays at the northeast corner have been knocked out completely. "The kiosk, unfortunately, has been involved in at least three accidents over the last five years," Mr. Cocola wrote in an e-mail message this week. "In all accidents, we believe a truck hit it." 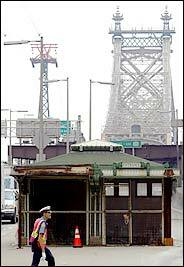 On July 22, transportation officials will ask the Landmarks Preservation Commission for approval to dismantle the kiosk and reuse it someplace else. "We are open to any ideas, thoughts and suggestions," Mr. Cocola said, particularly from the landmarks commission and the Parks Department. Amy L. Freitag, the deputy parks commissioner for capital projects, said the structure might have a place among the 26 historical buildings set around the 83-acre grounds of the Snug Harbor Cultural Center in Staten Island. But she, too, said she welcomed other notions for reusing the kiosk. And Mr. Cocola left open the possibility of restoring the structure in place. Preservationists, of course, recommend exactly that. "I just don't see why they should be permitted to remove the last bit of historic fabric from that poor bridge," said Jeffrey A. Kroessler, author of "New York Year by Year: A Chronology of the Great Metropolis" (New York University Press, 2002). "What else says that trolleys once ran over this bridge and that this bridge wasn't designed for automobiles?" If the kiosk had to be moved, said Simeon Bankoff, executive director of the Historic Districts Council, perhaps it could be shifted closer to the tram terminal and serve some transportation-related purpose again. The structure was originally the bulkhead over a staircase leading to the lower level, where trolleys were boarded, Mr. Kroessler said. Today, the 16-foot-by-16-foot kiosk is a storage shed for its own vestiges. Under an elegant roofline "Entrance" sign and behind a wire screen are stray architectural elements from the facade: a terra-cotta bay with an angular shield topped by a leafy garland, a pilaster decorated with a Greek key motif, brackets wrapped in ornamental scrollwork. Like the Queensboro Bridge market hall to the east, now shared by a Food Emporium and the restaurant Guastavino's, the interior of the trolley kiosk is distinguished by a vault of self-supporting herringbone-patterned tiles, known as Guastavino tiles for the father and son who designed them. Engineered by Gustav Lindenthal and designed by Henry Hornbostel, the bridge opened in June 1909. Three months later, trolley service began. Cars once ran from the Manhattan terminal to Astoria, but the line was shortened in 1939 to end at Queens Plaza, with a stop midway across the bridge where an elevator took passengers down to Welfare Island, as Roosevelt Island was then known. In the last year of operation before being replaced by buses in 1957, the yellow-and-orange trolleys made the 1.6-mile run in 10 minutes. A ride cost 10 cents. Some 125 passengers crowded the 44-passenger car for its last trip. "It is unlikely," The New York Times said in its valedictory editorial, "that the whooshing whine of the bus will ever be memorialized in song as was the clang of the trolley." As a method of getting to work or play, The Times said, the trolley was "on its own account, a way of having a good time." Five trolley kiosks were left behind. "We frankly cannot account for three of them," Mr. Cocola said. The other known survivor was moved in the 1970's to the corner of Brooklyn and St. Marks Avenues in Bedford-Stuyvesant, where it serves as the entrance to the Brooklyn Children's Museum. Because the museum was built underground, the trolley kiosk is its only architectural feature visible from the street. "Often people say, `Well, the museum is very small,' " said Beth Alberty, the director of collections. The kiosk, she said, will no longer be needed after a renovation and expansion of the museum, to begin this fall. The Transportation Department has already staked its claim. "We are open to using the parts from the Brooklyn Children's Museum kiosk to repair the one at the bridge, if need be," Mr. Cocola said. "Otherwise, we'll talk to Landmarks and Parks about this one too." The last surviving car, No. 601, a 1930 Osgood-Bradley Electromobile, was acquired by Everett A. White, founder of the Trolley Museum of New York. It journeyed over the years to Staten Island, to New Jersey and finally to Kingston, N.Y., the museum's current home, where the car is permanently stationed with 28 others. "Unfortunately, its condition is very, very poor," said Evan Jennings, the vice president of the museum. "However, the car still does exist and hopefully someday, when the funding becomes available, we'll restore it." 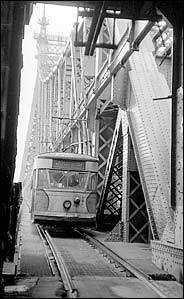 A trolley car on the bridge in March 1957, a month before service ended. And at a time when streetcars --ahem-- light rail is making a major comeback. I happen to think light rail is very economical. *It performs the same functions as subways at the same capacity, yet is easier and faster to build. *However, I'm not certain if such a system is well-suited for New York, considering that traffic is too bad to devote one or more lanes to grade-level rail. There was talk a few years back of a 42nd Street trolley. I could see a light rail line using a lane of West Street/12th Avenue. Isn't a rail line along 42 Street a component of NYC2012? I also remember some people proposing a light rail line along Second Avenue instead of a subway. *I happen to think that the street's to narrow to consider doing that, though. *A line along 12th Avenue/West Street might work, though. ^This thread hasn't been touched in a long time. Was wondering if it even existed. Hope Nexis4Jersey sees it. The streetcars were a waterfront fixture until the developer behind Fairway Market donated them to the Branford Electric Railway Association in East Haven. The move was a surprise to Bob Diamond, who says the cars belonged to his organization. An old trolley, loaded Sunday on a flatbed trailer, prepares to leave the Red Hook waterfront. FUGGEDABOUT Brooklyn — they’re in Connecticut now. Rusting street cars that had become fixtures of the Red Hook waterfront shipped out Sunday on flatbed trailers bound for an East Haven-based train association — all to the surprise of the trolley buff who claims to own them. “We have no idea exactly what went on,” said a shocked Bob Diamond, president of the Historic Railways Association. Bob Diamond claims he’d tried to talk to developer Greg O’Connell about restoring three rusting trolley cars, but he heard nothing until a friend alerted him O’Connell had the cars hauled away. Diamond stored three cars for more than a decade in a lot behind the Fairway Market next to Van Brunt Street. He’d hoped to put the trolleys — or at least pieces of them — in service again one day as part of a long-delayed dream to restore streetcar service in Red Hook, he said Monday. Crews haul away streetcars from the Red Hook waterfront on Sunday. His plans went off the rails on Sunday, however, when a pal told him a shipping company was hauling the cars away. Greg O’Connell, president of The O’Connell Organization, which owns the lot and other Red Hook property, issued a statement Monday, saying the trolleys and a “significant donation” were given to the Branford Electric Railway Association Sunday. The association operates the Shore Line Trolley Museum in East Haven. “Rather than let these historic trolleys continue to sit stagnant, building up rust and rot in Red Hook, the O’Connell Organization has passed them on to BERA, which has the ability to rebuild them or at the very least can facilitate a transfer to someone that will,” according to the statement. The old trolley cars, shown in 2010, graced the waterfront behind the Fairway Market in the Red Hook neighborhood of Brooklyn for more than a decade. Two of the cars were old Metropolitan Boston Transportation Authority trolleys and a third was once in service in Cleveland, according to the statement. Diamond, who rediscovered a train tunnel under Atlantic Avenue, said his only recourse would be to sue O’Connell — a step he’s not eager to take. The train buff claims he’s spent last year trying to contact O’Connell, a retired NYPD detective, about restoring the cars, but nobody responded. Bob Diamond, shown in the entrance to the old Atlantic Ave. tunnel that was used for trains and wagons, says he owned three antique trolley cars that were hauled away Sunday night by a Red Hook developer. O’Connell was once a big supporter of the Red Hook streetcar plans, Diamond said, but he soon soured on it when the city opposed the project. He claims a fourth, fully restored car was kept in storage in a Beard Street Pier warehouse owned by O’Connell. “What did he do with that one?” Diamond asked on Monday. The developer’s son, also named Greg, refused to respond to follow-up questions about the cars or if the company had permission to donate them to the Connecticut museum. The Branford Electric Railway Association did not return calls. Diamond said he’ll move forward with plans for a renewed streetcar service in the borough. “There’s more trolleys where those came from,” he said. The last trolley in Red Hook sits in an empty warehouse, its future uncertain. All of the other trolleys were removed from the waterfront on February 9th, 2014. All photos by Nathan Kensinger. When the Red Hook trolleys were carted away last week, it was yet another nail in the coffin for the neighborhood's colorful history. Over the past decade, Red Hook has been transformed from a gritty post-industrial backwater to a chic destination populated by shiny new establishments. Where wild dogs and burnt out cars were once common, masses of visitors now consume Ikea meatballs, shop at Fairway, and eat at massive new eateries like Brooklyn Crab and Hometown Bar-B-Que. The trolleys were a reminder of a different era in Red Hook, a time of ambitious dreams to improve residents' lives. A time when a man could rip up the cobblestones, lay track, and run an electric street car down to the end of his line. Bob Diamond, the man who rediscovered the world's oldest subway tunnel underneath Atlantic Avenue in 1980, had grand plans for Red Hook in the 1990s. With hundreds of thousands of dollars in funding from the city, he and his organization, the Brooklyn Historic Railway Association, had purchased over a dozen trolleys and built a half mile of track along Red Hook's streets. "The trolley route we planned would take you from Red Hook to downtown Brooklyn in 12 minutes," said Diamond, and would have connected with the Atlantic Avenue tunnel. "Everything was going along fine until the second day Bloomberg was in office, when we got a letter from the DOT saying our project was terminated." Diamond still doesn't know why the city killed his project, but claims that the Department of Transportation moved quickly to rip up his tracks and confiscate his building supplies. "They wanted to make sure our project was dead." Today, all that remains of Bob Diamond's trolley dream is two short sections of broken track and one last trolley, sitting alone in a warehouse. For over a decade, three other trolleys sat out on the waterfront, marooned. As they decayed, their popularity grew, until they became neighborhood icons. "There's probably photos all over the planet of people posing in front of them," said photographer Thomas Rupolo, whose book Images of Red Hook contains several shots of the trolleys. When Fairway Market opened its doors in 2006, the popularity of the trolleys skyrocketed, with lunchtime crowds exploring their interiors. The news that his streetcars had become a Red Hook destination was a shock to Bob Diamond. "For me, they were just a painful reminder of a failed project. Now I'm finding out that people were thinking of them as their trolleys. They became almost public property." Like much of Red Hook, the trolleys did not fare well in Hurricane Sandy. Five feet of water flooded through them and into Fairway, which was closed for four months after the storm. The corrosive effects of the saltwater hastened an already precipitous decline. Over the past year, the neighborhood has struggled back to its feet and old stalwarts like Sunny's Bar and Steve's Authentic Key Lime Pie have reopened, but many businesses report that they are still not fully operational. Throughout the recovery process, the trolleys sat and rotted, until they were removed by the O'Connell Organization to be donated to a museum. "We had been searching for a potential taker of these trolleys since Hurricane Sandy, but unfortunately, were unable to find any interested parties," said Greg O'Connell. "The damage done to these trolleys over the past decade, along with the impact of the Hurricane, had made it incredibly difficult for interested parties to make sense of taking on the cost involved." Like the demolished Revere Sugar Refinery and the paved-over Todd Shipyard, the trolleys' status as neighborhood icons may soon be forgotten, as a tide of new residents washes into the area. "It's sad to see them go," said Thomas Rupolo. "We have so little left on the waterfront as it is." For Bob Diamond, the last remaining trolley is the final piece of a dramatically reduced empire. In 2010, he was banned from re-entering the Atlantic Avenue tunnel, ending decades of access and his underground tour business. Yet he remains optimistic. "What we're hoping now, with the change in administration, is that we can restart our projects," said Diamond. He would like to hear from the new mayor and the new DOT commissioner, and would also like his last trolley to be relocated to a safer location. "That trolley could be a new symbol of a new street car line." For Red Hook's past, though, it may be too late. The three trolleys on October 30, 2012, the morning after Hurricane Sandy. Five feet of water had flooded through the trolleys and into Fairway. Though the water had already receded by the morning after the storm, many of the O'Connell Organization's warehouses were badly damaged. The last remaining trolley, seen here in January 2013, was housed inside the Eye Graphics + Printing company, which was inundated with six feet of water. By February 2014, Eye Graphics had gone out of business, leaving the trolley alone in an empty warehouse. "We have yet to decide what to do with the tracks, poles, and the trolley car," said Greg O'Connell. The BHRA logo, seen here in January 2013, has since peeled off the side of the trolley. "We are hoping Greg O'Connell will move it to a safe place," said Diamond. Bob Diamond inside the Atlantic Avenue tunnel in 2007. He still has not been down to Red Hook. "I don't want to get myself into some kind of depressed state." "It was a complete shock," said Diamond, on hearing his three outdoor trolleys had been removed. "I couldn't believe it." "We are trying to find renewed interest in our project," said Diamond. "It would be a really great thing." There’s a wonderful term for the dirt trails that people leave behind in parks: desire lines. Cities also have desire lines, marked by economic development and evolving patterns of travel. In New York, Manhattan was once the destination for nearly all such paths, expressed by subway tracks that linked Midtown with what Manhattanites liked to call the outer boroughs. But there is a new desire line, which avoids Manhattan altogether. 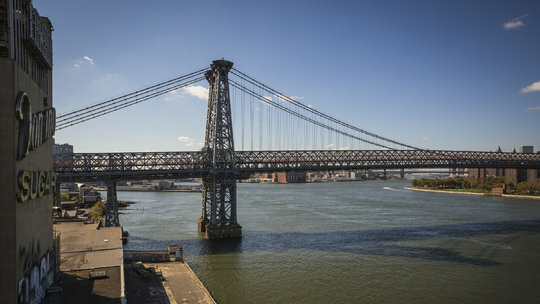 It hugs the waterfronts of Brooklyn and Queens, stretching from Sunset Park past the piers of Red Hook, to the Brooklyn Navy Yard, through Greenpoint and across Newtown Creek, which separates the two boroughs, running all the way up to the Triborough Bridge in Astoria. The desire line is now poorly served by public transit, even as millennials are colonizing Astoria, working in Red Hook, then going out in Williamsburg and Bushwick — or working at the Navy Yard, visiting friends in Long Island City and sleeping in Bedford-Stuyvesant. They have helped drive housing developments approved or built along the Brooklyn waterfront, like the one by Two Trees at the former Domino Sugar Refinery. But this corridor isn’t only for millennials. It’s also home to thousands of less affluent New Yorkers struggling to get to jobs and join the work force. So here’s an idea: bring back the streetcar. Some of this route is served — barely — by subway lines like the G, the city’s sorriest little railroad. In Astoria, stations for the N and Q are nearly a full mile or more from the East River, meaning a vast swath of that neighborhood is virtually disconnected from the subway system. It’s an area ripe for growth — for new housing, start-ups and other small businesses and industries — all the more so with the coming of the Cornell Tech campus on Roosevelt Island, just across the river and linked to Queens via the F. One can imagine another Silicon Alley spanning Cornell, Astoria, Williamsburg and Sunset Park. Right now, it’s easier by subway to get from Long Island City to Midtown, or from Downtown Brooklyn to Wall Street, than it is to get from housing projects in Fort Greene or Long Island City to jobs in Williamsburg, or from much of Red Hook to — well, almost anywhere. A few Brooklyn and Queens residents may like their inaccessibility, but transit is about more than getting around. It maps a city’s priorities, creating a spine and a future for neighborhoods. It’s about economic as well as social mobility. So while Mayor Bill de Blasio continues to refine his agenda, including that promise of 200,000 units of affordable housing, he might consider a streetcar connecting Red Hook to Astoria. Why a streetcar? Buses are a more obvious solution. Improved bus service is an easier sell, faster to get up and running, and cheaper up front. A bus would be ... fine. But where’s the romance? A streetcar is a tangible, lasting commitment to urban change. It invites investment and becomes its own attraction. I’m not talking Ye Olde Trolley. This is transit for New Yorkers who can’t wait another half-century for the next subway station. Streetcars connect neighborhoods and people to other modes of transit. They aren’t about getting around quickly (although the streetcars in Atlanta and Salt Lake City have the capacity to go pretty fast); promising prototypes are self-sustaining and wire free. Some systems bleed money, but in cities like Seattle and Portland, Ore., retail and real estate values have boomed along the routes. Streetcars don’t hog the road, either. Part of Kent Avenue in Brooklyn, at the heart of the waterfront corridor, was recently narrowed to make room for bikes and pedestrians. A full-fledged light-rail line would require its own lane and create an obstacle between most of Brooklyn and a waterfront that has taken decades to reclaim for public use. But a modern streetcar, using only a modest track buried a few inches into the asphalt, shares the road and flows with existing traffic. By providing an alternative to cars, streetcars also dovetail with Mayor De Blasio’s vow to improve pedestrian safety. And there is this additional political virtue: no permission required. Even though the mayor has to grapple with Albany and doesn’t run the Metropolitan Transportation Authority, he rules the city streets. Credit for thinking up the route belongs to Alex Garvin, the urban planner. He floated the idea nearly a decade ago as a bulkier light rail line. The proposal was discussed in City Hall and in planning circles but languished. Updated, its time has come. The route — others are possible, so let the debate begin — would start in Astoria Park and run along 21st Street. Moving south to Long Island City, it would cross a dedicated, movable bridge to be built across Newtown Creek with bikes lanes and room for pedestrians, restoring a subway bridge torn down years ago. In Brooklyn, the route would follow Commercial Street to Franklin Street to Kent Avenue and eventually end up on Columbia Street at the Erie Basin in Red Hook, along the way linking to subways and to ferries that now suffer because they’re disconnected from the transit network. I called Brad Read, whose California firm, Tig/m, is one of the companies developing self-powered, wireless streetcars. He came up with $241 million as a cost for the cars and installing the rails along the route. So double that number once or twice back here on Planet Earth, then add the bridge and operating expenses.... O.K., I hear the Bronx cheers. Too expensive, not important enough, a pipe dream. But the truth, though, is that healthy transit-supported development — we’re not talking about a $4 billion Path Station here — nearly always pays dividends in New York. A streetcar for Red Hook was mooted several years ago and didn’t gain much traction because ridership was anticipated to be low. But this route feeds into a more ambitious network and looks toward growth, just as the ferries are heavily subsidized because they’re supposed to lay the groundwork for the future. Today, a city that attracts young entrepreneurs who favor old, mixed neighborhoods and industrial buildings, and whose employees like to ride bikes, take public transit and live near work is thinking ahead. So is a city that doesn’t leave behind its poor citizens in neighborhoods that have long had meager access to public transit. Housing costs come down to more than the cost of housing; they include the cost of transportation, in hours and dollars. A streetcar, in that respect, is about making more affordable vast public housing campuses in Fort Greene, Williamsburg, Long Island City and Astoria, as well. There will always be competing priorities, limited resources and buses. But New York shouldn’t throttle its ambitions. Remember when bike lines were considered impossible? The mayor ought to lead the way here. The city’s urban fabric can’t be an afterthought. The keys to improved city life — better health care, housing, schools, culture, business, tourism and recreation — all have spatial implications. New York’s great leaders in the past have capitalized on the city’s physical opportunities, not ignored them. Urban planners talk about how transit-oriented development concentrates density around transit hubs. The streetcar for Brooklyn and Queens is development-oriented transit. Before the subway came the Manhattan grid, conceived some 200 years ago. The expectation then was that most people would move east and west toward the busy waterfronts along the shorter numbered streets, not north and south. But desire lines turned out otherwise, and over decades the grid was rejiggered and adapted to include avenues like Madison and Lexington, and Central Park. Now neighborhoods along the waterfront beckon again. Is the city up to the challenge?